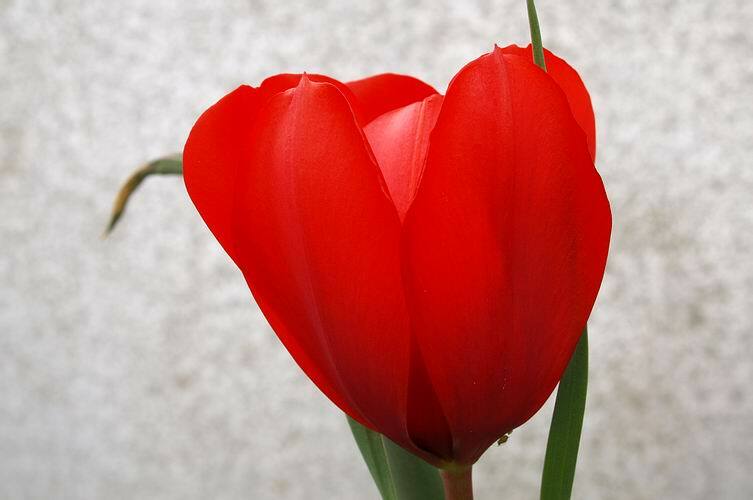 My recently acquired Tulipa montana is now in flower and what a colour it is - it has to be one of the brightest reds in the bulb world. It was one of the many tulip species that I saw growing in a field in Holland a few years ago which I was very attracted to and I made a list of the ones I wanted to try - this desire was much reinforced by the publication of Richard Wilford's book 'Tulips'. I am pleased to say that I am slowly managing to track down the ones I would like to grow. I am not alone in saying that digital photographs sometimes show us details that we failed to observe in the life and the eagle eyed readers will already have noticed the aphids at the bottom right hand side of the flower. This is a timely reminder to check the rest of the bulbs for aphids and if necessary I will spray with an insecticide - this small community was simply wiped out. easily grow 5cms in one day and I get the chance to enjoy the flowers at their best. To me Narcissus triandrus is one of the gems of the wee daffodils - it is so elegant and graceful I could never have enough of it. Unfortunately I find it some what short lived under my conditions and it is slow to increase vegetativly, so seed is the only way forward. 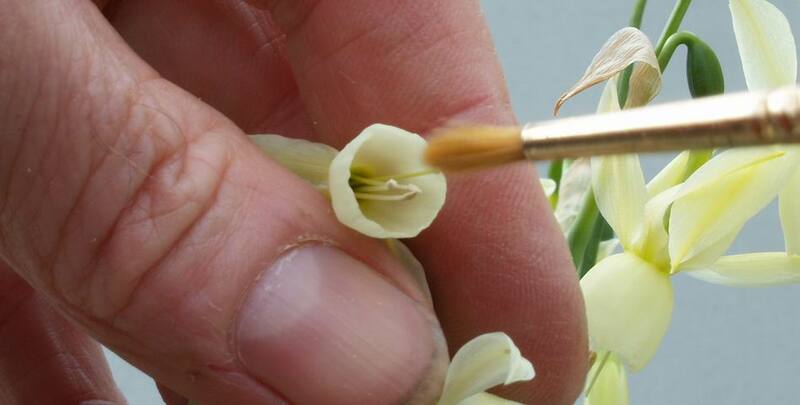 To ensure that I stand the best chance of getting a seed set I leave nothing to chance and always pollinate the flowers with a paint brush. I do this over several days because part of the plants strategy to prevent self fertilisation is that the pollen and stigma do not always ripen at the same time. 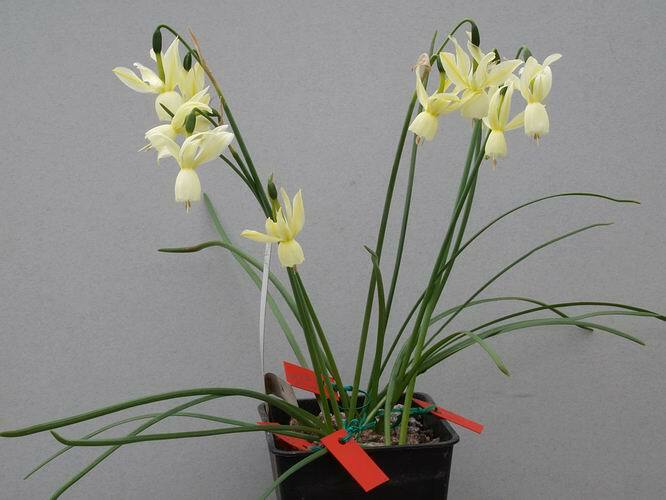 Narcissus triandrus is also very promiscuous and will cross with many other Narcissus which has resulted in many fine hybrids. 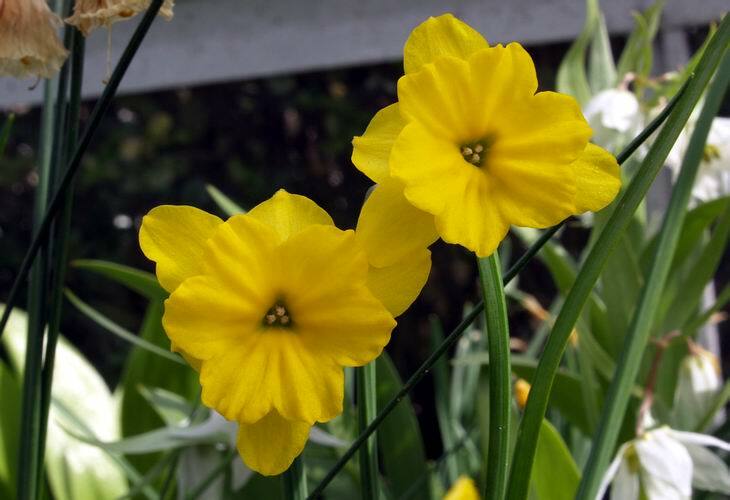 I have made a number of hybrids using Narcissus triandrus as the seed parent and I have again crossed this potful with a number of compatible species such as N. rupicola and bulbocodium also I have tried to back cross it with N. x susannae which is already a hybrid between N. triandrus and N cantabricus. I attach small labels to each flower stem indicating the cross I have made so that I can correctly label any seed that I get. A good indicator I have observed that my cross has been successful is that I never get as many seeds in a pod which has hybridised as I do when it is just the species - one time I am happy to see a small seed count. 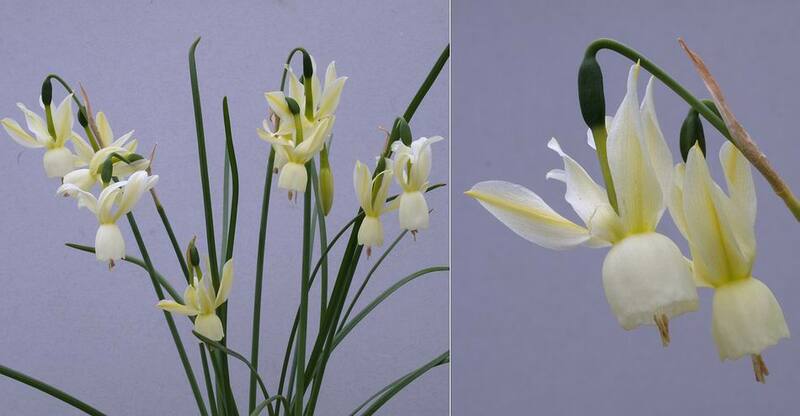 One of the pollen parents I have used is this good form of Narcissus rupicola ssp marvieri. 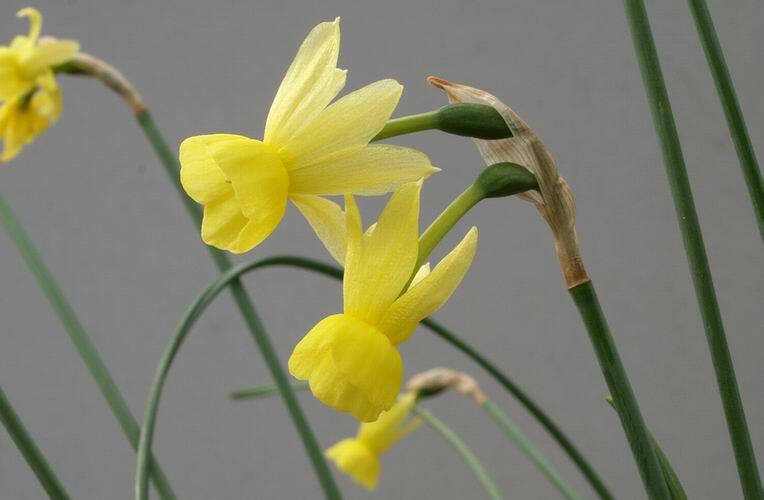 Narcissus triandrus also crosses freely in the wild any where it shares a habitat and Narcissus x incurvicervicus is the result of it crossing with N fernandesii. One of the frits that I have named is Fritillaria 'Craigton Cascade' which I suspect is a cross between F recurva and affinis. It is a very beautiful plant that can have as many as eleven flowers on a cascading stem. 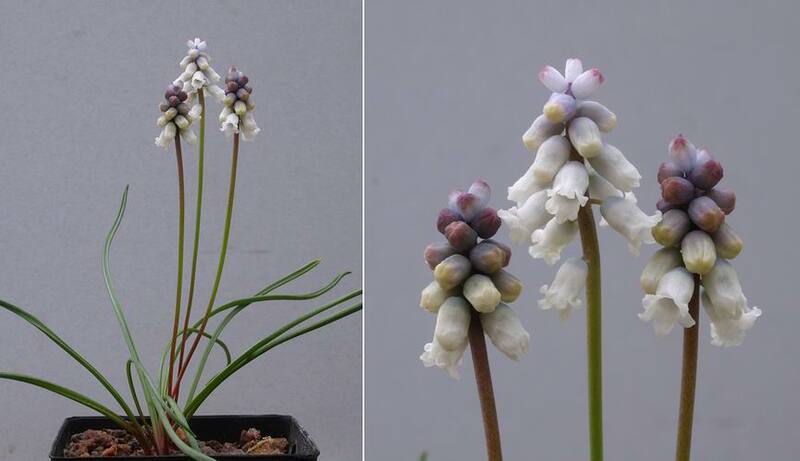 Because I cannot be sure of the exact parentage and that it was being widely distributed by the freely produced rice grains I chose to give it a cultivar name. 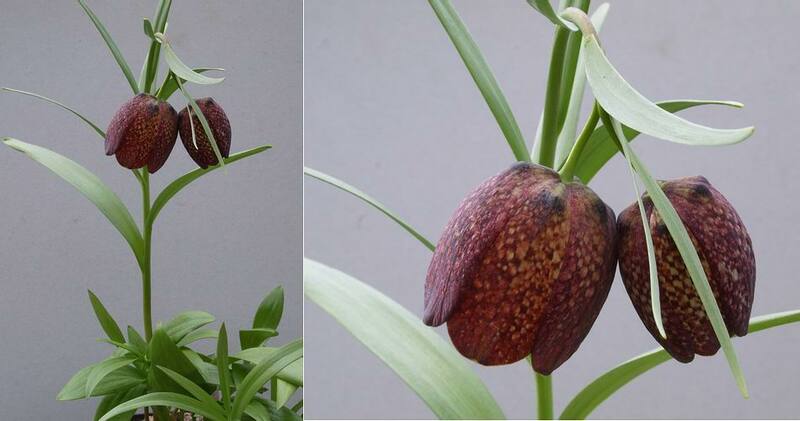 I raised this plant from seed as Fritillaria kotschyana but I think it is Fritillaria grandiflora. 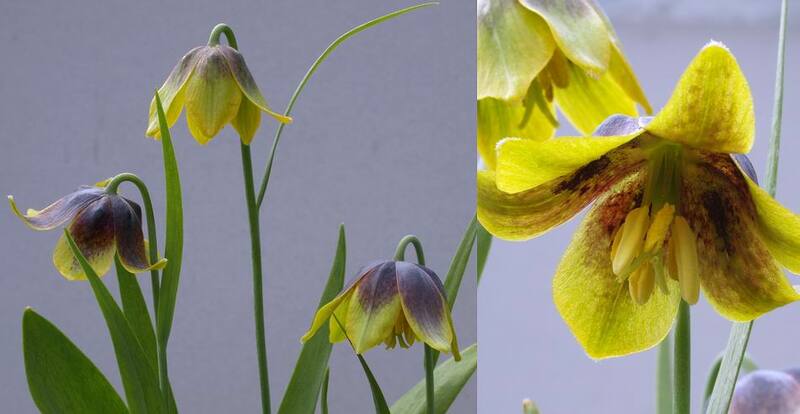 I have this same plant from other sources and I put it to the Joint Rock Garden Plant Committee as Fritillaria grandiflora; they gave it a PC but called it Fritillaria kotschyana grandiflora which annoyed me as I think that they are two distinct species. 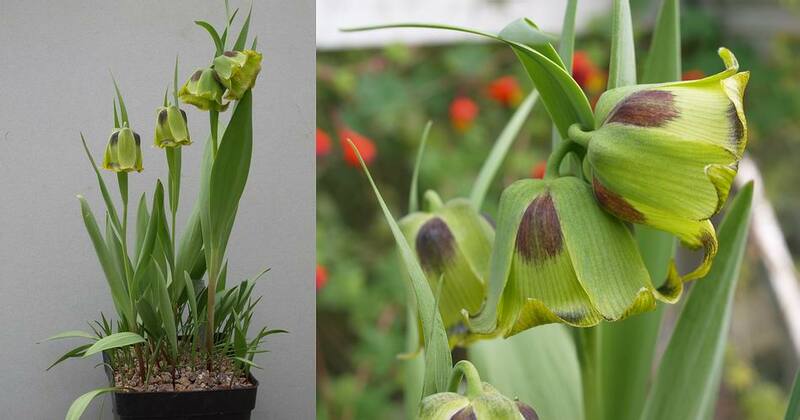 If you are , in the Fritillaria pages of the forum, Tony Willis shows this plant as Fritillaria kotschyana which he acquired from Dieter Zschummel - Kiev Botanic Garden was the source of the seed. I have since seen other plants labelled F.kotschyana grandiflora which to me look like a large version of kotschyana- this plant is different. 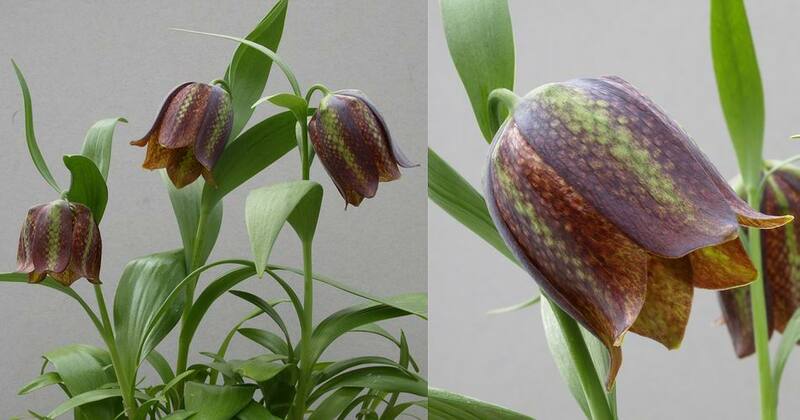 Here is Fritillaria kotschyana do you think it looks the same? I do believe that there is confusion here and that we are looking at two different plants being given the same name. 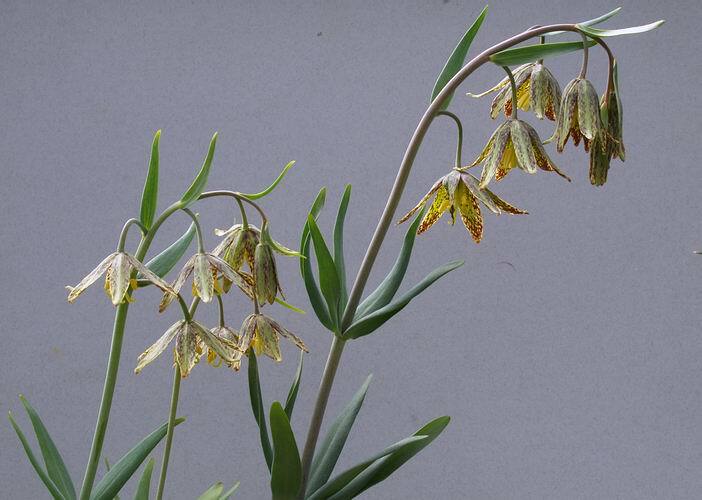 Talking of confusion in plant names, Diane Clements put a beautiful frit up to Joint Rock a few weeks ago as Fritillaria acmopetala wendelbowii - but it was clearly not that species at all. 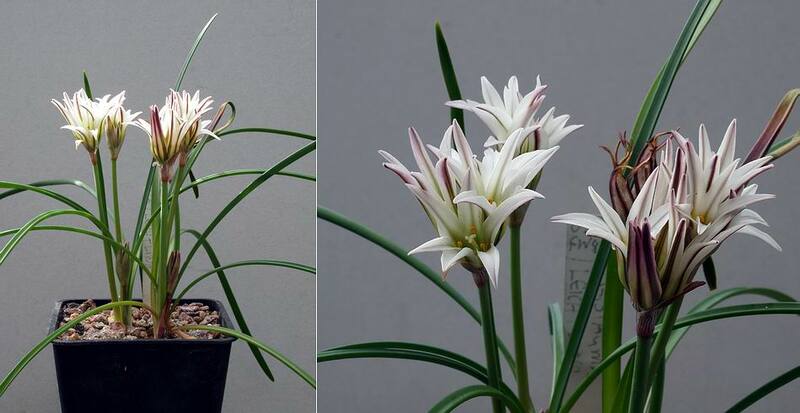 I suspect that Diane's plant, which can be seen in the Blackpool Show thread on the forum, is closer to F crassifolia but I would need to pull a flower apart to tell and I don't think she would have been too happy about that. This is Fritillaria acmopetala wendelbowii which I got from Gothenburg Botanic Garden and it is a distinct and very attractive form of the easy and common F. acmopetala. A frit that has similar colouring to F. michailovskyi is Fritillaria rhodocanakis but you could never mistake these two species. Fritillaria rhodocanakis has much more open, flat faced flowers. Again you will notice the slight variation in the colour of these seed raised plants. I raised this pot of Tristagma leichtlinii from Fern and Watson seed sown in February 1996. 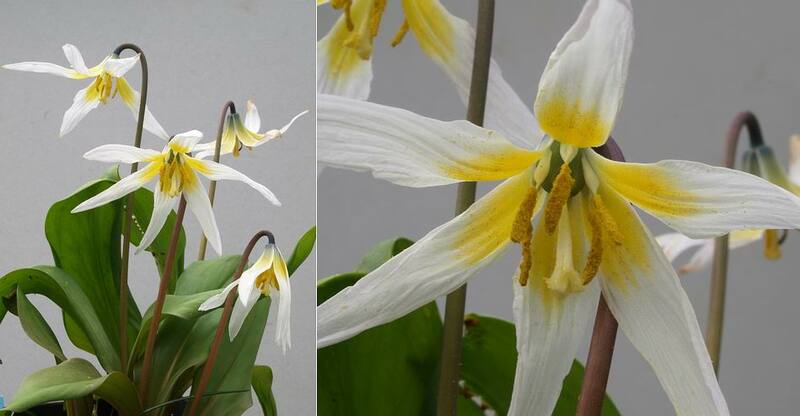 I do not know if this is still the correct name, there seems to be a lot of changing around of the names in the South American bulbs. 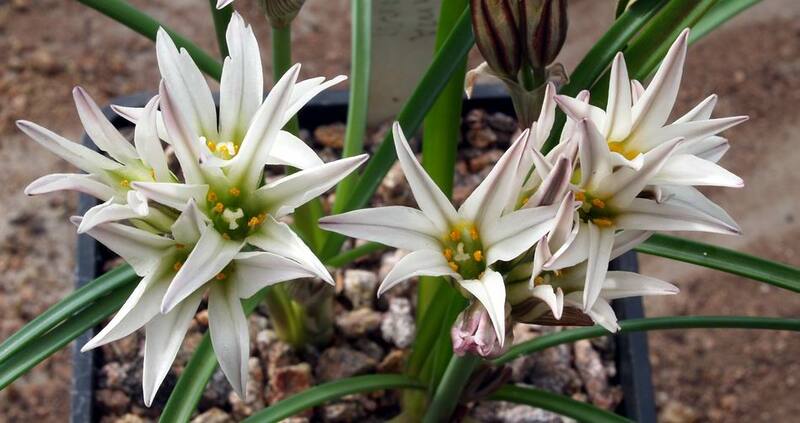 It is a pretty bulb which, while it does not increase rapidly from the bulb, grows well and sets good seeds most years so I have a number of pots coming on.